Deputy Director for Research of the Russian Arctic National Park, Ph.D. in Biology. 1979-1984: Studied at Leningrad State University (Biology and Soils Faculty, Vertebrate Zoology Department). 1984-2013: Engineer and researcher at the Department of Polar Countries’ Geography of the Arctic and Antarctic Research Institute. 2000-2003: Scientific Secretary at the Russian State Museum of the Arctic and Antarctic. 2005-2007: Senior researcher at the Icebreaker Krasin Museum, a branch of the World Ocean Museum in St. Petersburg. 2006-2007: Participated in developing the scientific basis for the Russian Arctic National Park project. Defended her thesis, “The Ivory Gull (Pagophila eburnea) (Phipps, 1774) in the Russian Arctic: Features of Nesting in the Modern Optimum Range,” at St. Petersburg State University in 2011. 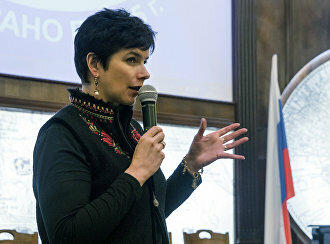 Leading researcher at the Russian Arctic National Park since its establishment in 2011; Deputy Director for Research since 2012.